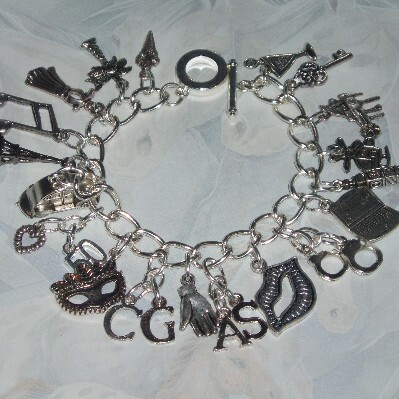 50 Shades of Grey handmade charm bracelet loaded with ice cream cone, palm tree, dress, music note, Eiffel tower, Beetle car, 50, heart, mask, C G initials, twitchy palm, A S initials, smart mouth, handcuffs, computer, Big Ben, Charlie Tango helicopter, piano, key, and cocktail charms. Must have for any 50 Shades of Grey fan. Great gift. You can now choose to have a sterling silver chain.